Are you as excited for fall decorating as we are?! 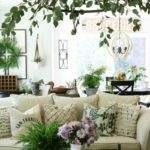 As summer begins to wane we want to give you some decor inspiration to jump-start your transition into the cozier months of the year. Nothing says fall like the perfectly decorated front porch!! 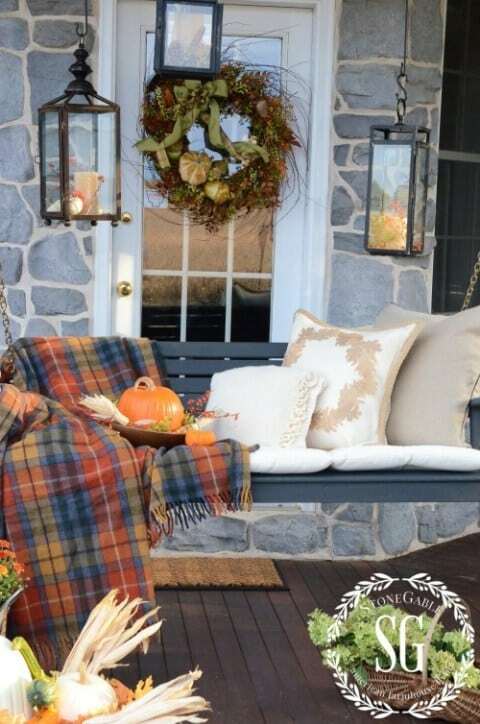 So we searched long and hard to find our favorite fall porches that we know you’re going to love. 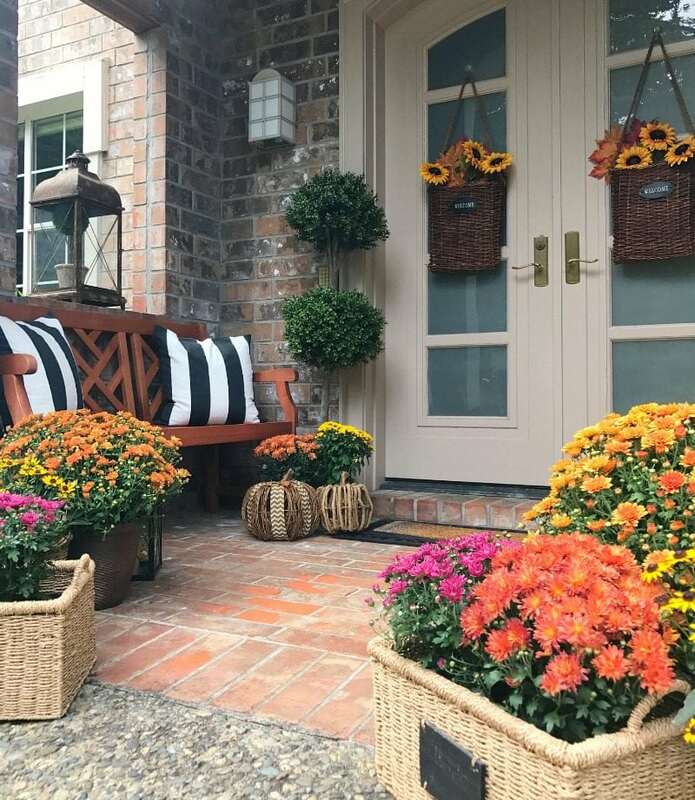 Come along with Jodie and me as we show you some AMAZING fall porches and why these are some of our favorite ideas for fall decorating. Most importantly, we want to show you how to create similar looks in your own home. Looking for indoor fall decorating ideas? Visit our Fall Home Tours for plenty of ideas and inspiration to bring the best of the season into your homes. Visit Jodie’s HERE and Julie’s HERE. Enjoy! This was my fall front porch from last year. I used a variety of flowers to bring warmth and excitement to my porch. Shades of yellow, magenta and orange clearly welcome fall while allowing summer to live just a tad bit longer. I also added some vibrant sunflowers to my hanging door baskets to make the yellow pop. Lots of baskets and even wicker pumpkins create a warm country look. We love how Liz from Liz Marie Blog went all out with her pumpkins! Having steps leading to your front porch certainly makes this easier. She made beautiful use of the space by lining the stairs with an array of pumpkins, mixing unique colors and shapes for a freshly-picked-from-the-farm look. 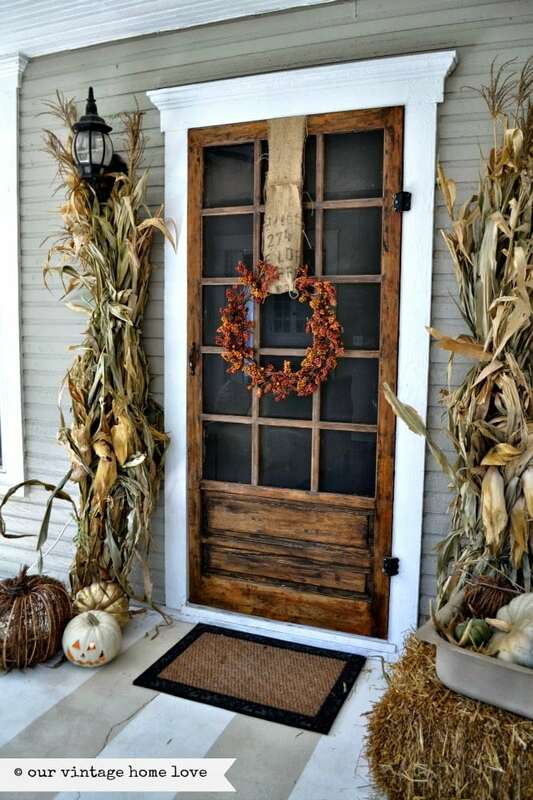 We love how Robin from All Things Heart and Home added rustic hay bails on her front porch for a classic fall feel. She certainly brought the pumpkin patch home with her! 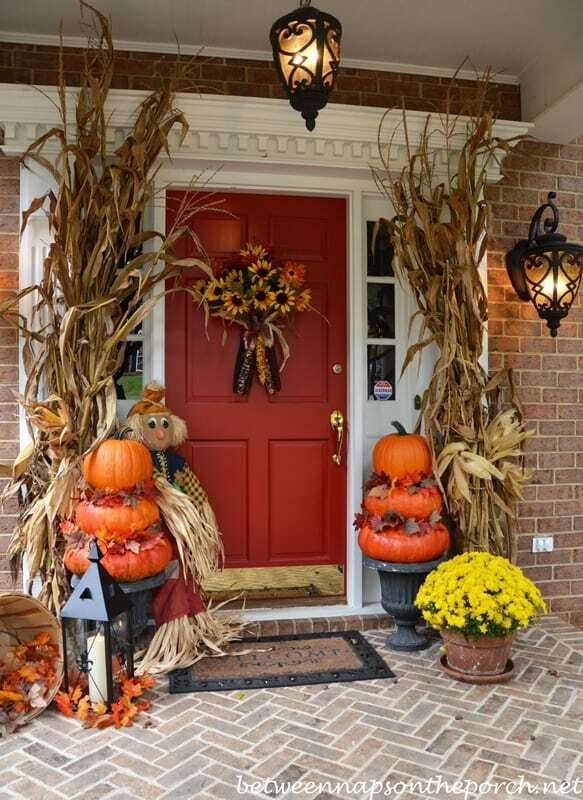 Robin even added a cute fall wreath garnished with miniature pumpkins to complete the look. You can’t create a fall look without festive pumpkins! It’s simply not done. Get the family involved and take your kiddos on a fun-filled adventure to the pumpkin patch where they can pick out their own pumpkins. Go for a variety of sizes and shapes to mix it up a little. Don’t be afraid to choose a variety of colors. Use white pumpkins like Taryn Whiteaker does to create a cleaner, tranquil look. Orange pumpkins will give you classic fall vibes. Either way you can’t go wrong! We are in love with how Kimberly at Serendipity Refined found the perfect balance between flowers and pumpkins. She even managed to pull off a light blue door in the midst of the orange and yellow accents surrounding. So adorable! 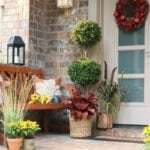 Another must-have for an inviting fall front porch are flowers! 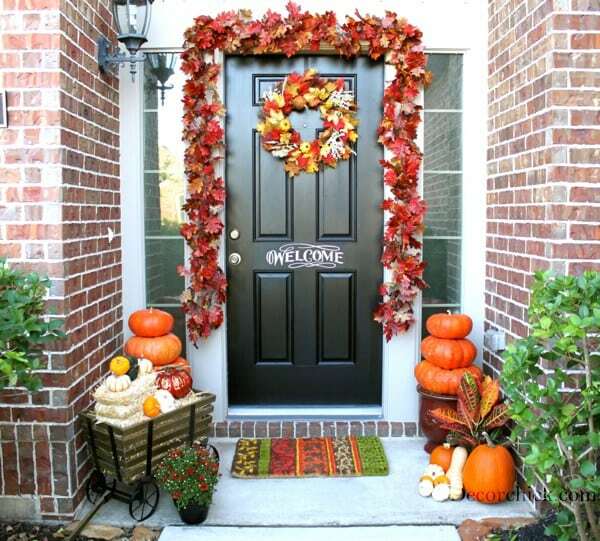 Fall is the perfect time to bring in a wide range of colors to your front door. Go for all shades of yellow and orange, and don’t be afraid to add some white flowers and leaves like Heather and Vanessa from At the Picket Fence. What a great way to welcome guests! 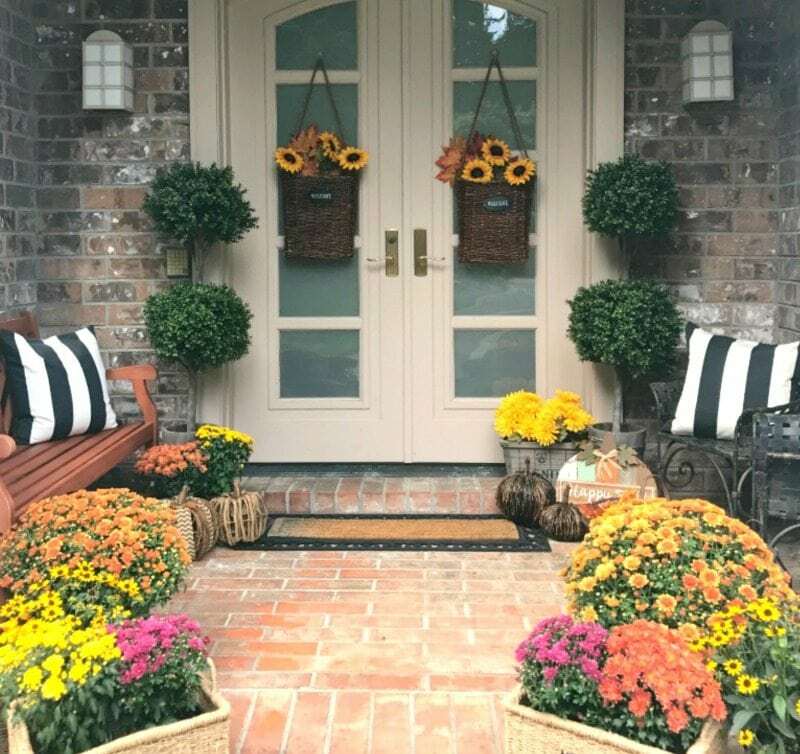 This is Jodie’s front porch from last fall and she really went all out with the flowers! The floral inspired wreath and the array of flowers beneath is a great way to mix the beauty of summer and fall seamlessly. She clearly wanted summer to stay just a littler longer. Just because summer is over, doesn’t mean flowers are out of style! Who said corn was just for the dinner table? Create the feel of the corn field right at your front door with towering husks on either side of the entryway. Jodie and I love how Susan at Between Naps on the Porch went all out and created a door garnish with sunflowers and corn. 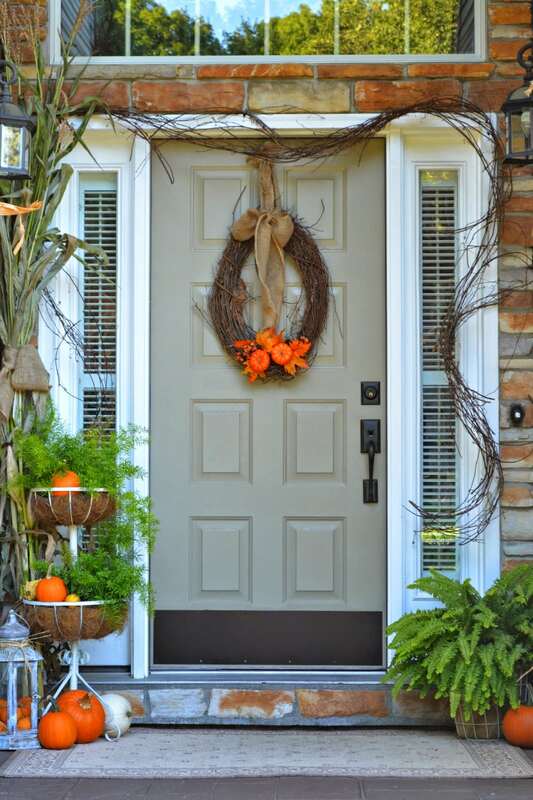 Add a warm, fall-inspired paint color to your front door to complete the look. 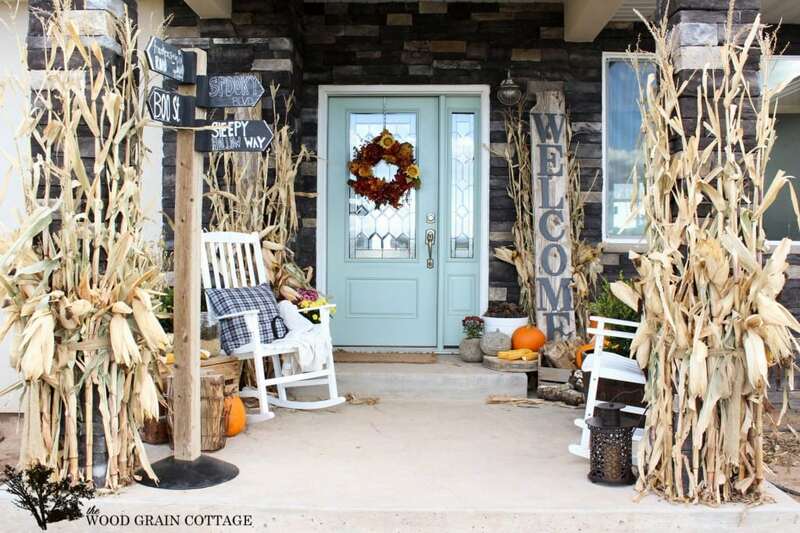 We absolutely love how Diana at Our Vintage Home Love didn’t hold back with her vintage farmhouse fall porch. She created a back-country, authentic farmhouse look with her rustic hay bails, distressed wood door and towering corn husks. It’s simply gorgeous! 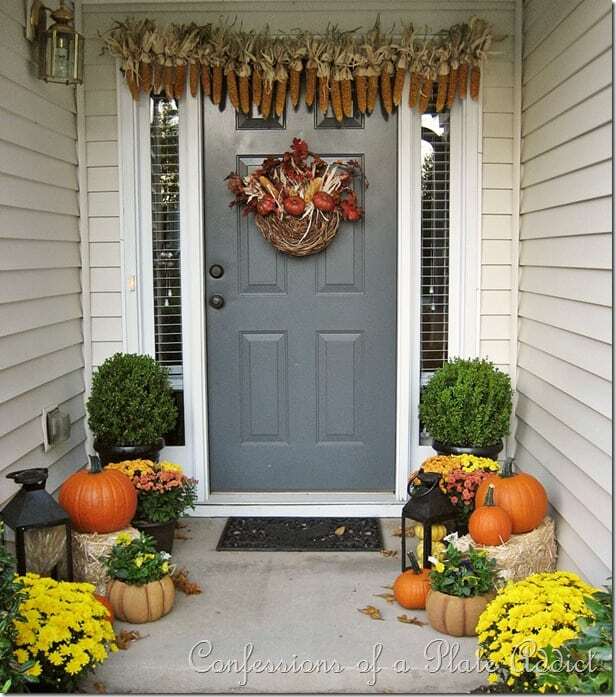 Tracie from Cleverly Inspired adorned her beautiful glass front doors with fabulous fall leaf wreathes. Huge mums beautifully frame the space. It’s not overdone but perfectly welcoming. 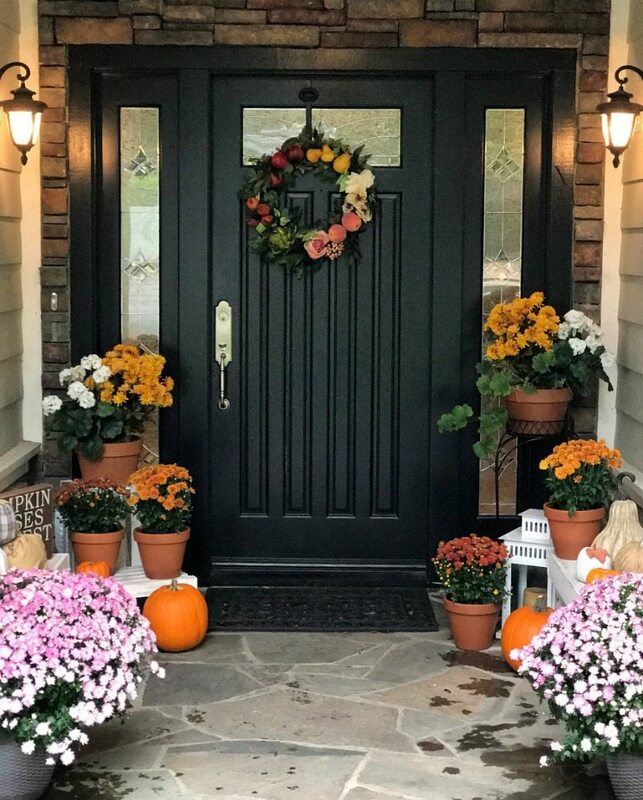 Laura Trevey did a great job of creating a memorable fall front porch that is classic and unique all at once! 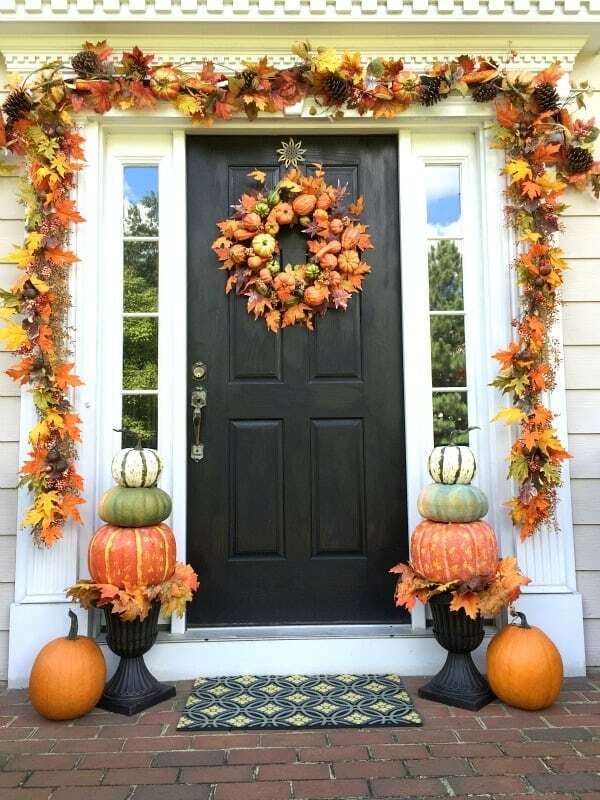 We are loving the pumpkin and leaf filled wreath and matching garland. Jodie and I love how from Martina from Northern Nesting created a simple and understated look while still making a fall statement! 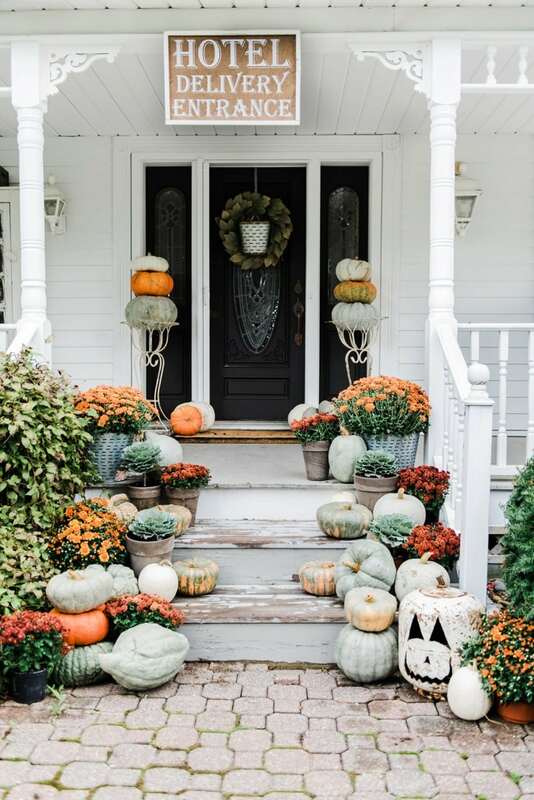 The pumpkins scattered along the porch and in the wreath really catch your eye. The grey door contrasts beauitfully with the vibrant orange as well. 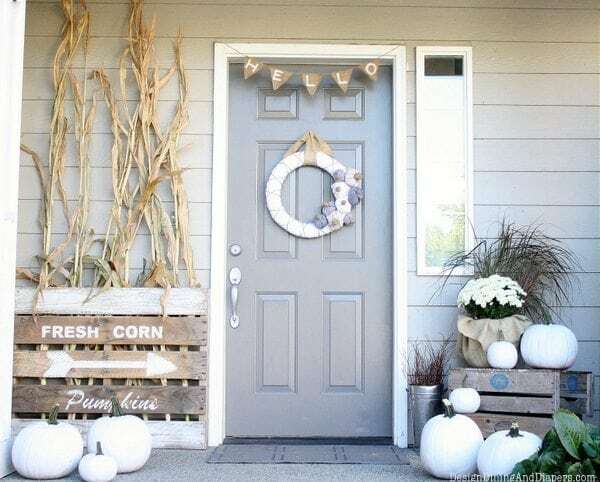 If you’re looking for a clever way to incorporate fall to your front porch, try draping a corn garland across your door frame like Debbie at Confessions of a Plate Addict. 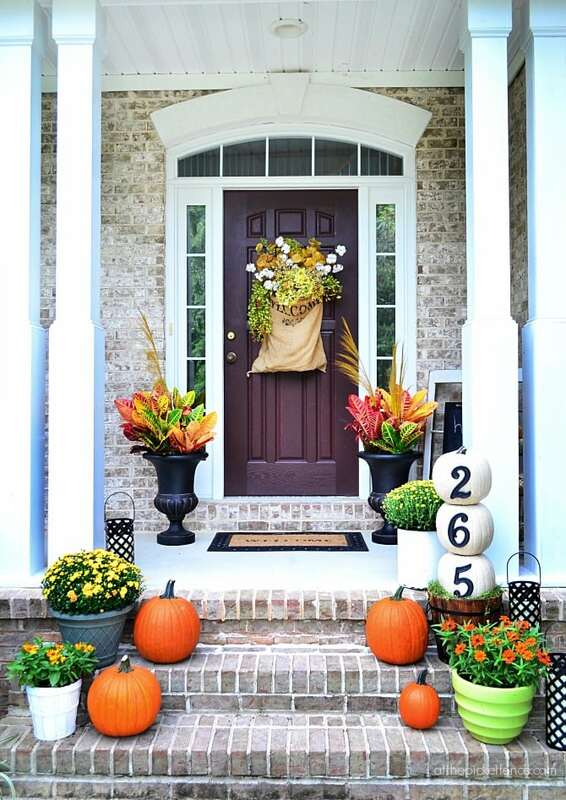 Symmetry with her flowers and pumpkins complete the frame creating the perfect fall welcome. Emily at Décor Chick added a vibrant red leaf garland around her sleek black door. Towers of orange pumpkins and a fun fall wagon create the perfect fall welcome. Send your guests an inviting message before they even enter your home by adding a chalkboard sign to your front porch. Create a simple message like Daune from Cottage in the Oaks. Add pumpkins, leaves, and other fall foliage to create the right mood. If you aren’t particularly skilled at chalkboard art, don’t worry. We love using chalk pens and stencils to get just the look you want. We love how Keri from Shaken Together Life put her creativity to use with her festive chalkboard signs. 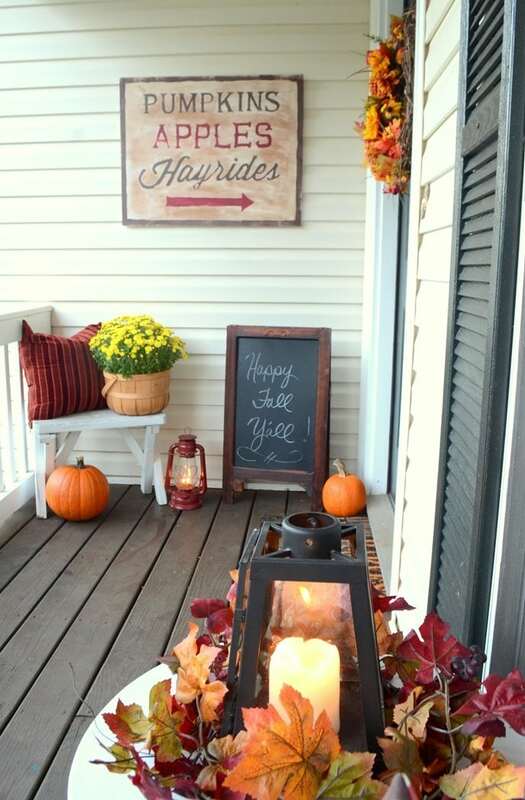 What a cute way to welcome guests and get them in the fall spirit! If you are going for more of a bold, fall look gravitate towards warmer shades like reds, yellows, oranges and dark greens. 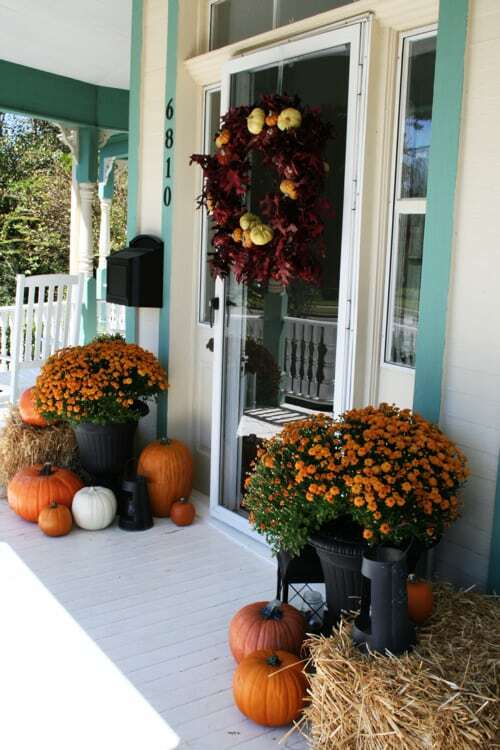 This will turn your front porch into a classic fall oasis that will make your neighbors envious. In my front fall front porch from last year, I used vibrant flowers to warm up the look! Don’t be afraid to take risks when it comes to color. Fall colors never have to be boring! If you want a more subtle take on fall choose cooler tones like shades of white and blue together. Think white or tan pumpkins paired with light blue and neutral accents. 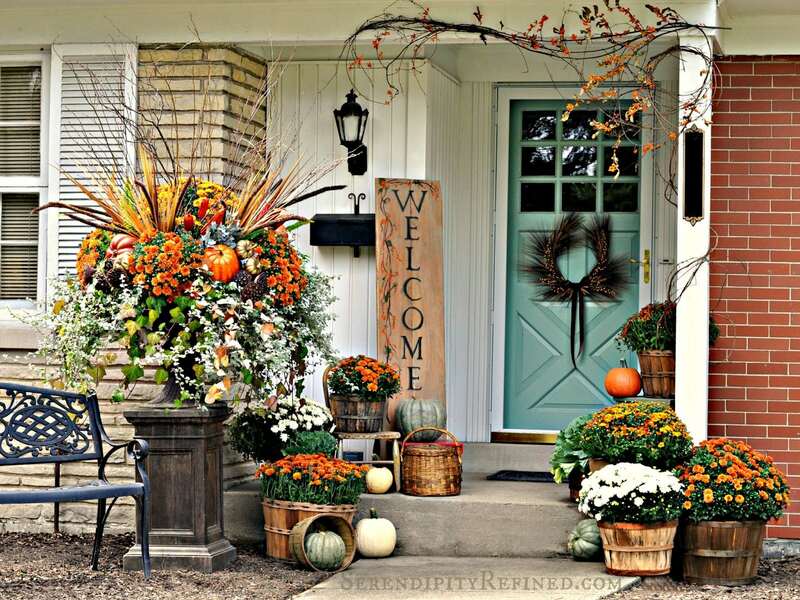 This will give your front porch a tranquil, understated look that is still perfect for fall! 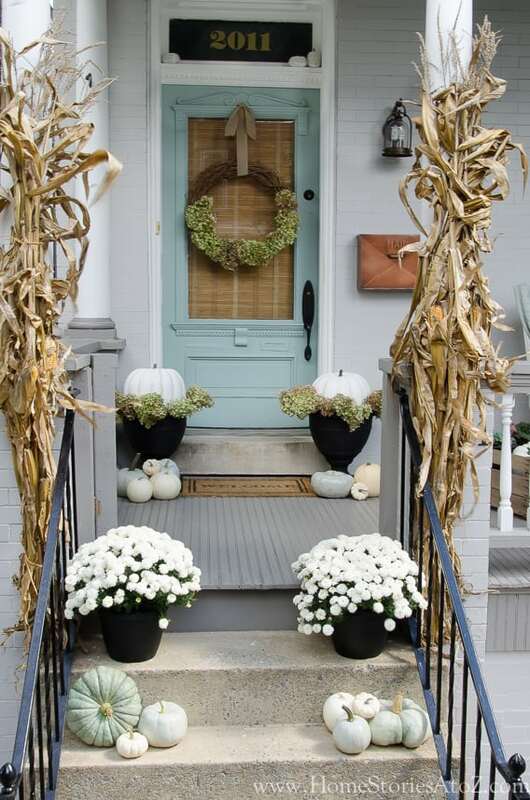 We love how Beth at Home Stories A to Z created such a unique look with her pale blue front door, white flowers, and array of blue and white pumpkins. Welcome guests by turning your front porch into a cozy destination, perfect for chilly fall nights with a cup of hot cocoa and a warm blanket. We love how Yvonne from Stone Gable Blog turned an ordinary porch swing into an inviting retreat. Her neutral pillows blend easily with her plaid throw making it an ideal spot to relax and take in the beauty of fall. We love how Shayna from the Wood Grain Cottage cozied up her front porch by adding plaid pillows to her adorable white rocking chairs. Corn husks and plenty of fall details create an undeniably fall mood that wows visitors and passers-by. Add rustic lanterns to your front porch to create a relaxing mood lighting or simply fill with miniature pumpkins or leaves. Here are two examples we love. Ann from On Sutton Place filled her lanterns with yellow and orange pumpkins. Christina at The Frugal Homemaker filled her lanterns with simple white candles. We can’t choose which we prefer! 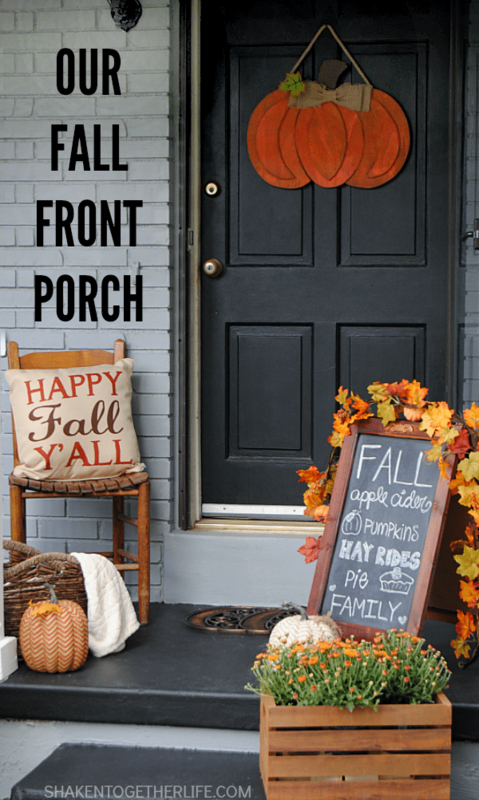 We hope these inspirational front porches get you excited about fall decorating! Take these ideas and allow them to fuel your imagination. 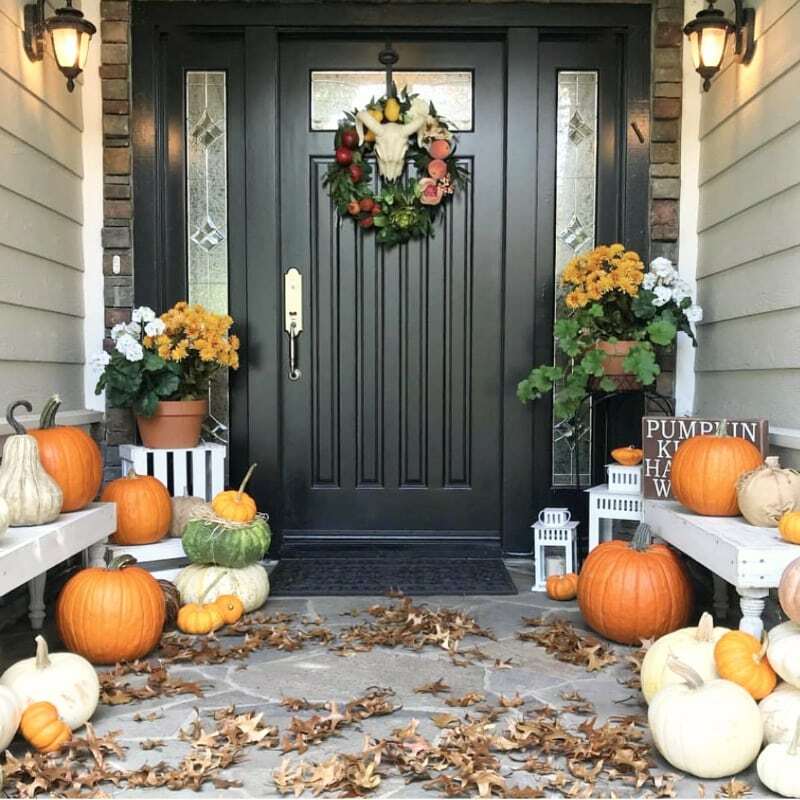 Pick and choose your favorites to create an original and unique fall porch of your own. Let us know what you love the most. We can’t wait to see what you come up with and wish you luck as we get a jump start on this new fall decorating season. Happy Fall Y’all! 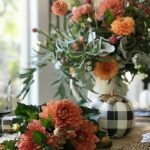 Want 3 Fresh Ideas to Make Fall Decor Fabulous? 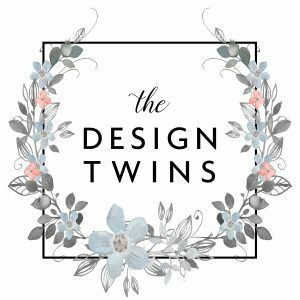 Want to Share in The Design Twins Television Adventure? 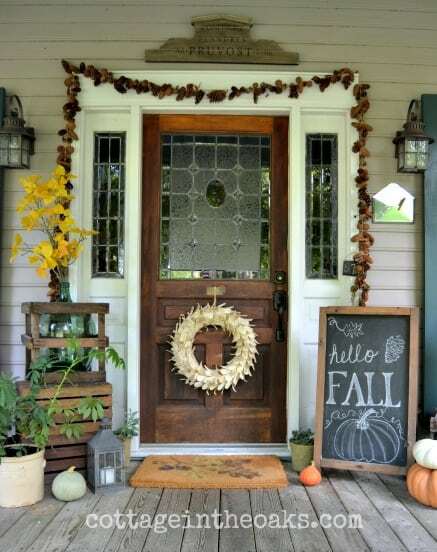 Fall decor begins with the front door and we've got 23 of the best fall front porches to inspire your creativity! 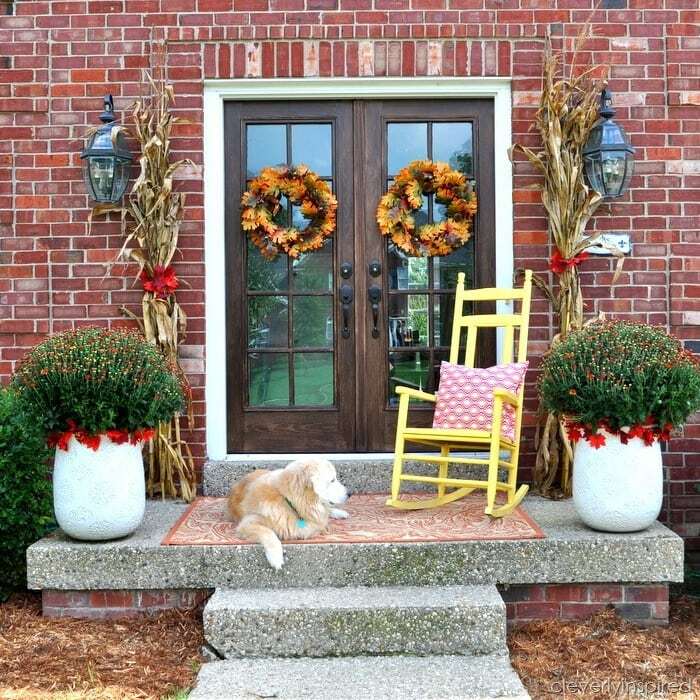 23 great fall porches showcasing dozens of ideas to help you create your own fabulous & welcoming front porch display. The wreaths are my favourite. I love all the fall decor! We are so glad you enjoyed this post! Hope this gave you some inspiration to start decorating for fall! Thank you for the kind words! 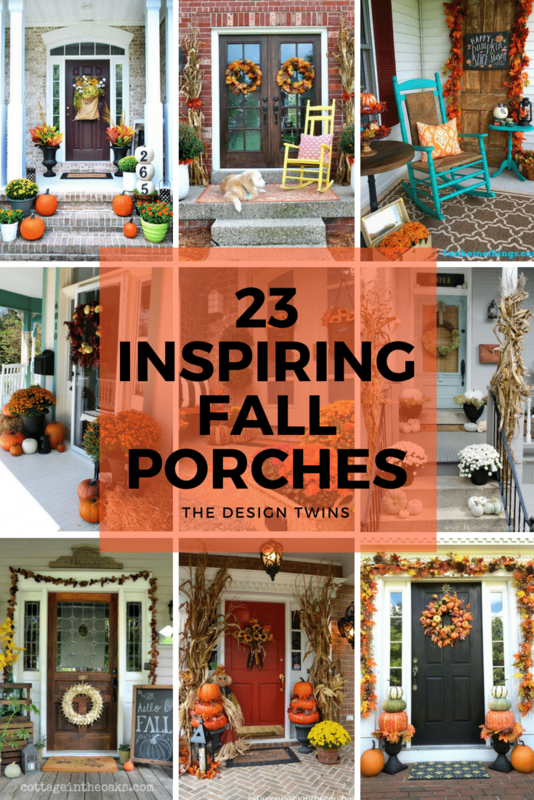 Thanks so much for including my fall porch in this fabulous roundup! 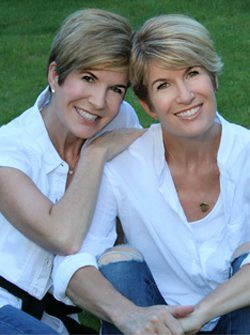 There’s so much inspiration packed into this one post! 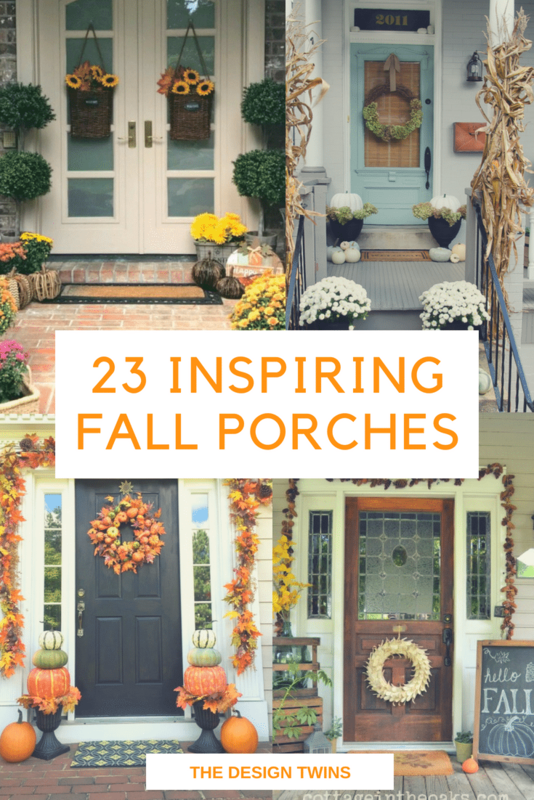 Looking forward to checking out all these great porches for some autumn inspiration! You are so very welcome sweet friend! Your porch was just too gorgeous to leave out of this post! You are so talented! I simply love these plans. These photos are wonderful and tasteful. 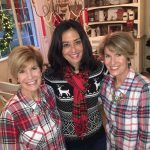 Much thanks to you for sharing DIY and embellishing thoughts and motivation. Thank you for the sweet comments! So glad you loved these DIY ideas and tips! Wow I love all the ideas and styles.. Thank you for the sweet comments! 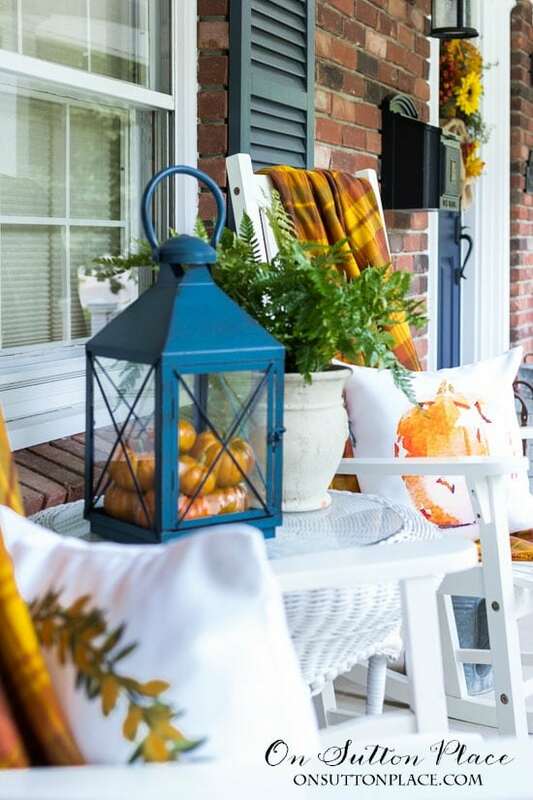 We are so glad you enjoyed some of these ideas for fall porches! I just love these pictures. They are awesome. Thanks for sharing. I really liked your decor. Thank you so much for the kind comments! We are so glad you found this post helpful!